J.C. Corcoran has been working in the media for several years, and he's also a very good writer. 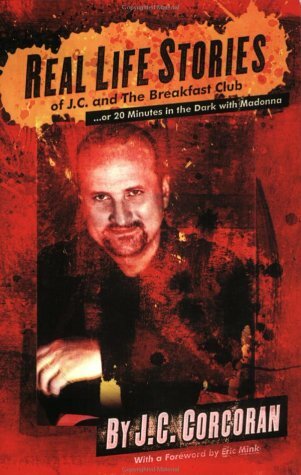 His book Real Life Stories of J.C. and the Breakfast Club...or 20 Minutes in the Dark with Madonna is mostly about his radio (and TV) career in St. Louis, but you don't have to know that market or even his show to appreciate the book. His stories are entertaining and he offers interesting insights into the radio and media business. I previously interviewed him for my podcast about his career. I should answer this question, then duck...because it'll drive people who are trying to get published absolutely crazy. I was asked to. I was off the air at the time ("between jobs" as they say in the business), and was sending out a weekly newsletter called "JC Mail," which was a collection of random thoughts and sort of a text version of the show, really. A guy who owns a publishing company here was a subscriber, and sent me a note that said, "I think you should write a book!" I responded, "I think you're right!" About ten months later I did my first of about twenty book signings for Real Life Stories of JC and the Breakfast Club...Or Twenty Minutes In the Dark with Madonna. (The title refers to an interview I was doing with Madonna when a power failure hit.) That book went on to become the fastest-selling book in the publisher's history. How did you write it? Was it hard to remember all the anecdotes and experiences you had? The mistake most creative people make is that they don't record or write down their ideas. The greatest idea in the world is useless if you can't REMEMBER it. At the time I carried one of those little voice-recorders around religiously. When I had an idea or recalled a story I thought might be usable I'd bark it into that recorder. Then I transcribed and organized the hundreds of entries and started writing. When you started writing, did you do an outline? How did you organize all those stories? Did the publisher help you? The publisher didn't really contribute. I outlined things. The first book was a lot easier because there was a chronology of sorts. It was, in essence, part autobiography, so you start at the beginning, talking about how you got into the business, who your early influences were, then trace the development of your career and take everyone right up to what was, at the time, present day. Your book makes the radio biz seem really intense and difficult. How would you describe it? Cut-throat. Radio might be on the bottom rung of the show-biz ladder but it's still show business. And show business is a cut-throat racket. ANY form of show-business is cut-throat. Radio is no exception. If you're successful at something, there's always a bunch of people observing who don't think you deserve it and think they can do it a lot better than you can. Radio and show-business is no place to go looking for friends. Now, you may MAKE some friends along the way, but I've found it's the exception to the rule. What do you think of radio's future? As for radio's "future," I'd say it's not good. And outside of a few rah-rahs, consultants and industry proponents whose very existence depends on a thriving broadcast industry, I don't know too many people IN the business who think much of it anymore. And, really...why WOULD they. The people calling the shots, by-and-large (and many of them ARE, btw...) are running what's left of it into the ground with ridiculously long commercial stop-sets, a great-diminished on-air staff, decidedly UN-exciting music programming, talk show hosts more interested in what THEY have to say than what their listeners have to say...and all of this at a time when radio is facing its most challenging competition in history. It's all a recipe for disaster, really. How did people respond to the book when it came out (people in the media and fans)? Even some of my biggest detractors praised the book because it really was good! I didn't see a single, rotten review. They saved all their venom for the SECOND book! But I think people were really surprised to see I could write. Even my dad, who was a voracious reader, was just stunned. Why did they save venom for the second book? I think I stunned everyone, even including my greatest detractors, with the first book's "quality." Nobody saw it coming. When the second one came out they had "recovered," righted themselves, and got their claws out again. In their defense, the second book wasn't nearly as good. But you can only tell your life story once, and I did that in book #1. How did you have the energy to do so much in your career and keep those crazy hours? I've never been afraid of hard work. I won't say it was the most difficult thing I ever did, but it required tremendous focus. I was newly-divorced so I was pretty much able to write, for the most part, every day for about eight months. What about when you were working in radio? I noticed you did morning radio which required waking up very early, plus you did promotional and other activities. There were really long days and I worked really hard. If you're going to sign on to do these kinds of jobs you have to understand it just comes with the territory. But I really enjoyed being as prominent in the market as I was at the time. I mean, the new "Batman" movie comes out and you're one of a small handful of people who's seen it? That's exciting to know hundreds of thousands of people are listening to and watching what you say, and wondering how YOU got to be sitting across from George Clooney and kidding around with him. There is an incredible rush that comes with that. It's like being handed the baseball to be the starting pitcher of the World Series. What kind of reaction did you get from the people who you wrote about in the book, such as Emmis management, the head of KMOX, and others? Much to my surprise, I think most people derived a twisted sense of "enjoyment" over having been referenced in the book. But the thing I really had going for me is that I was very much a "pack-rat" back in those days. So I literally had the newspaper clips, letters, memos, videotapes and other documentation for every story I told, every claim I made and every person or group I called out. It's sort of hard to challenge the validity of a story when you include the clip from the newspaper or a transcript of an encounter. What kind of feedback did celebrities give about your assessments about them in the back of the book? Well, I knew they'd never see that stuff because they're all in California and New York, so I was real brave about the things I wrote. Now, I also wrote about some local "celebrities," but I don't recall much reaction. Frankly, in most cases it was a lot of more-detailed back-stories of things, events and people most of my readers already knew about and had an opinion about. This book was published about 15 years ago. What would you change, omit, or write differently? I'm embarrassed to admit there were sixteen errors, typos or mistakes. I got the most guff about referencing the address of "The Munsters" address incorrectly. I'm serious. Also, I had a lot of issues with the editor that was assigned to my project. She was a 40-ish, single, very Catholic type and I just don't think she got it. So I'd want a different type of editor. I may also have wanted to "slicken" up the production values. We had an awesome cover and introduction, but the font, resolution and other curb-appeal aspects of the book could have been better. But, in terms of content, I was pretty pleased at the time. It was a first venture. You learn a lot. What did you learn, and what advice do you have for people who want to write a similar book or another non-fiction book? Advice: Take notes for six months to a year. Along the way, write down specific phrases and/or short thoughts about exactly HOW you want to write certain passages. WRITE DOWN your ideas!!! Test out some of the stories on friends and family. See if they react with interest and curiosity to the extent you anticipate. Remember, when Jay Leno was at the absolute peak of his popularity and making twenty-five million dollars a year, he was still out every Sunday night at a comedy club in Hermosa Beach testing out new material. What did I learn? That writing a book is hard. At least it is if you want to write a real good one. I've been thinking about this for a while and have searched online for blog posts or articles about extroverts dealing with an introverted culture, but have barely seen anything. Some articles tend to be about the characteristics of extroverts vs introverts, or how extroverts are misunderstood. But in my case, I've had to submerge my more extroverted qualities to survive in the introverted world. First of all, I'm not struggling as much as I was several months ago when I was doing a lot of work that didn't require much talking because I've been teaching, which requires talking and the ability to connect with people. Plus, my coworkers are extroverts and are truly interested in people, so I feel like I've been liberated from the introverted shackles that surround people like me who just want to be ourselves. When I first returned to teaching after a couple semesters off, my boss asked me what was wrong because I was so quiet. I told her that I had been silenced and limited for months, and had to act a certain way to survive and be tolerated. It seems like a weird concept in a place of extroverts, but I eventually adjusted to that more open environment and have felt satisfied. And in my non-teaching work, I don't deal with people directly but I work with people who like to chat, so it's a good balance. Still, it shouldn't be so rare that I have to write about the exceptions. I'm married to an introvert, so I know very well what they're like. They're drained by people, they need alone time, they feel pressure to talk, etc. There are several articles and blog posts about introverts' trials and tribulations, especially since Susan Cain wrote the book Quiet, which I read with amazement. What world is she talking about?! In many workplaces, it seems that only certain people are allowed to talk or even attend meetings and conventions. But I see those people as part of the elite, or in highly paid jobs that are hard to get. When a meeting is required, usually the managers are the ones that go, and if more people are invited, the lower level employees aren't really allowed to give feedback or show their personality (especially if they work in a hierarchy of personality), so they have to stay quiet. Yet Cain was talking about meetings, social functions, group work...she was a highly paid attorney in a high-powered job. The average worker doesn't have such opportunities. And it's more apparent when an extrovert has to deal with such a situation. A lot of work has to be done on a computer, and that has nothing to do with people interaction. I'm sure she had to work on a computer too, but she was in a privileged position that allowed her to walk away from the screen to attend the extroverted functions she abhorred. Hey Susan Cain, if you have a Google alert activated and see this blog post, please contact me and explain how I can get a piece of your extroverted chores. I will gladly take on speaking engagements (she's become so successful, that she has expanded the opportunities from her extroverted-oriented jobs to having to do speeches, including the impossible-to-score Ted Talk), social activities, and other tasks in a life that seems far from the usual drudgery that people have to put up with. For an extrovert, jobs shouldn't have to be totally people-oriented to be satisfying (like nursing, teaching, customer service, retail). I don't want to always work with people because I like to write, research, read, take care of website content, and do other introverted things. But hey, people like me who like to do such work also want people contact and to laugh and socialize. We want social interaction to break up the silence. We don't mind being interrupted. We want to use our minds but occasionally use our mouths, too, and we want a lively atmosphere because we like people-oriented stimulation. But I've noticed that in situations where computers are a necessary tool and there's a certain power structure in place, the ones who are in the special segment get to do more than just stare at a screen. They get to go to functions and conduct training sessions and socialize with others in the upper echelon. And it's not just attaining such access to those more extroverted activities, but being able to be ourselves. That in itself should be a blog post, because I think it is very difficult to be yourself, even if "experts" in American culture say that's the ideal goal. Actually, being yourself can be detrimental whether you're an extrovert or not. One time I talked to someone who loved acting, loved becoming someone else, loved becoming a character. I've always maintained that I would love to be...me. We're too busy trying to survive by not being who we are, that becoming someone else seems to be superfluous. However, even if it is rare, it is possible to be who you are if you're working or circulating in social/extracurricular circles where such tolerance to authenticity exists. Then there's the changing workplace, where work isn't done at a company with other people. I often hear about the great economy that existed after World War II and for several years after that, where people got jobs...somewhere physical. Now companies are fractured and people freelance or work alone. What a perfect economy for an introvert but a nightmare for an extrovert. Even if someone has a job at a place, they may not be able to stay there long or establish relationships with their coworkers due to downsizing, layoffs, dysfunction that results from paranoia and restrictions, etc. But in Cain's baffling world, people have jobs, they work with others, they have to survive a workplace where collaboration and communication are required. What a great concept...can you hook me up with your nightmare? Anyway, other than work is just the world that we live in--it's more introverted because technology has created walls. A lot of interaction is online or through other digital tools, and people don't know how to communicate offline so well. That's another reason why I find Cain's book puzzling. She talked about the school culture, which is very well suited to my needs, since there are lots of social opportunities and clubs to join. But once we leave school, we're faced with a hyper-individualistic culture where people use their phones more for texting than talking, and where people like to stick to small talk, if they talk at all, because they haven't been socialized too well to actually deal with people. Everyone says introverts don't like small talk, and guess what...extroverts like me don't like it either. We like to communicate with live people and have fun, but that doesn't mean we want to talk about nothing all day. Also, people assume that extroverts like talking to just anyone, but I really clam up when I encounter phony people. That's when I do seem like an introvert. In fact, I've worked or been in so many situations that were restraining, thus were better suited for introverts, that I've learned how to be more introverted myself. I've gone days without talking, and inside my head I was suffering, but outside I seemed like a bland, quiet person who didn't have much to say. People have even told me I'm introverted and have been surprised when I've said I really am not. I'm just not a shallow extrovert (and there's nothing wrong with those kinds of people--at least they're excited to live) but rather someone who really is energized by people--as long as they're interesting and not phony :) So to those introverts who feel like they have to be extroverted: I have had to be like you to survive as well. In fact, if Cain did hire me to work for her introverted empire, I'd fit in well because I not only could take on her extroverted tasks, but I would be able to conform to her introversion because I've already been doing it for years. I did work in a situation that required both introverted and extroverted characteristics, and I had a great time because I worked on a computer for hours, but sometimes salespeople or other extroverts would come in to ask questions, request certain projects, or just chat. It was fantastic because I could use my mind and analytical abilities but could also socialize once in a while. On the flip side, I worked in a situation where there was no extraneous talking tolerated, and I wasn't allowed to ask questions until the end of the day. Or I had to gather up the questions to ask them all at once sometime during the day. So if an extroverted person were to blend work talk with social talk, we'd get in trouble. Introverts are lucky that they have technology and air conditioning and other things that take them indoors away from people. If you're suffering in a world of extroverts, think about how many times you have to work on a computer, or when you have the option of a computer and phone over live people. There are many opportunities to not socialize with people, especially if you have a quiet job instead of a people-oriented one, and you don't have to go out after work, either. There's TV, Internet, books, a solitary walk, and lots of other things introverts can do. But if you're an extrovert and want to score an invite to a cool social event where there are people you can click with, or want to have a job where talking breaks up silent tasks or a top-heavy structure, then good luck! Maybe my short tale of struggle will cause other extroverts to share their stories, thus counter the abundance of pro-introvert stuff online, which is where introverts seem to love to hang out.